In many QA systems, fine-grained named entities are extracted by coarse-grained named entity recognizer and fine-grained named entity dictionary. In this paper, we describe a fine-grained Named Entity Recognition using Conditional Random Fields (CRFs) for question answering. We used CRFs to detect boundary of named entities and Maximum Entropy (ME) to classify named entity classes. Using the proposed approach, we could achieve an 83.2% precision, a 74.5% recall, and a 78.6% F1 for 147 fined-grained named entity types. Moreover, we reduced the training time to 27% without loss of performance compared to a baseline model. 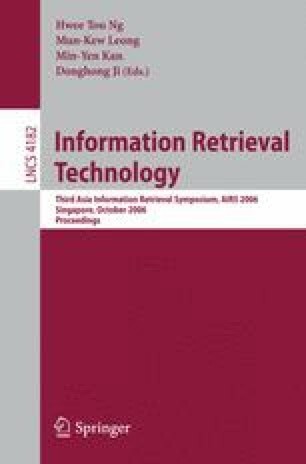 In the question answering, The QA system with passage retrieval and AIU archived about 26% improvement over QA with passage retrieval. The result demonstrated that our approach is effective for QA.